The bullet train corridor which is 508-km long connects Ahmedabad and Mumbai and reduces the travel time from six-and-a-half hours to two-and-a-half hours. The first train is set run in 2022. MUMBAI (Metro Rail News): The National High-Speed Rail Corporation Limited (NHSRCL) proposal for seeking permission to remove 1.5 lakh mangroves spread over 50 acres in the districts of Thane, Navi Mumbai, and Palghar in order to make way for the country’s first bullet train corridor has been approved by the expert appraisal committee of Ministry of Environment and Forests (MoEF). It has been a long-standing debate environment or development? And in most of the case development becomes a priority and environmental concerns take a back seat. NHSRCL is executing the PM Narendra Modi Ambitious bullet train project, which will run between Mumbai and Ahmedabad. Last Month, The Corporation had moved to Bombay High Court after the Maharashtra Coastal Zone Management Authority (MCZMA) refused permission to remove 50 acres of mangroves, owing to a direction by High Court not allowing to do so. Following this, the corporation approached the High Court after MCZMA rejected its proposal on December 22, 2018. Mumbai-Ahmedabad bullet train corridor, 155.642 km out of the 508 km passes through the state of Maharashtra which affects 131.3 hectares of forest land. The forest area includes mangroves, which are spread over 32.43 hectares. 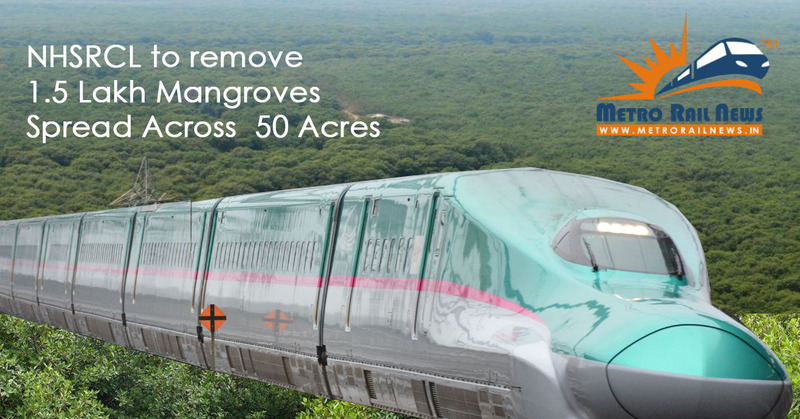 The report further stated that the NHSRCL in its proposal had stated that around 1.5 lakh mangroves spread over an area of 18.92 hectares will be affected by the bullet train corridor. Maharashtra govt at the previous hearing had filed an affidavit through Mr. Vikas Jagtap, Divisional Forest Officer (DFO) of Mumbai Mangrove Conversation Unit, stating that part of the proposed project is within the protected area and eco-sensitive zone of Sanjay Gandhi National Park and Thane Creek Flamingo Sanctuary. it also stated that the project alignment passing through the creek is proposed inside an underground tunnel that will be 25-40 meters in depth. The tunnel necessitates felling mangrove trees on the surface. With the implementation of this proposed project, the flora and fauna of flamingo sanctuary and adjacent areas will not be disturbed. The bullet train which is 508-km long connects Ahmedabad and Mumbai and reduces the travel time from six-and-a-half hours to two-and-a-half hours. The first train is set run in 2022.